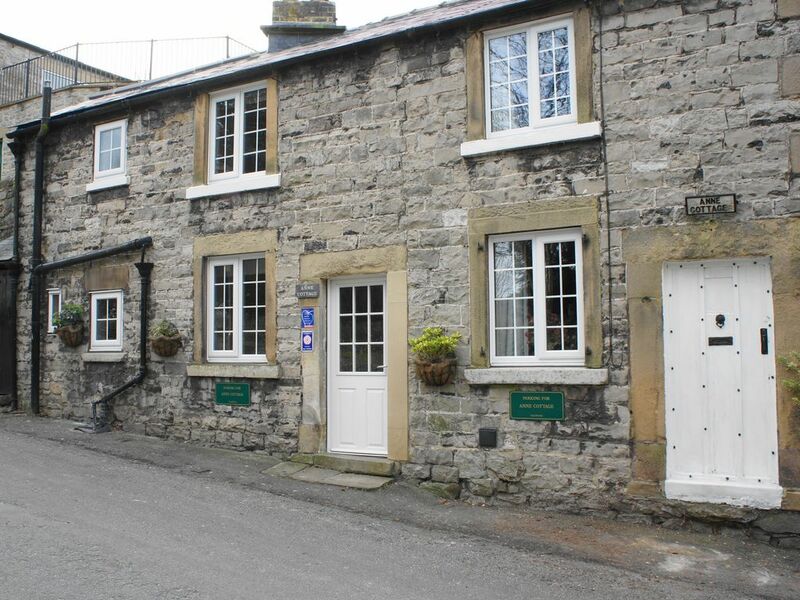 Anne Cottage which has a Visit Britain 4 Star rating is in Bakewell, famous for its Bakewell Pudding, which nestles on the banks of the River Wye and is a tourist attraction with its Monday market and old world charm. Unusually because it was once two cottages, there is a separate staircase to each en-suite bedroom, one of which has a king size bed and the other twin beds which affords our guests the extra privacy of separate suites. The cottage is about 800 yds up hill from the centre of town and so offers the visitor the opportunity to walk into town to sample the many pubs and restaurants or visit the Monday market where you might pick up a bargain. There is a great selection of shops selling antiques and gifts, walking gear and some fabulous food shops to tempt you into something delicious for dinner. Bakewell is also a great centre to access the beautiful countryside whether you wish to drive or walk, and attractions such as Chatsworth House, Haddon Hall and Alton Towers. We now also offer free Wi-Fi access with the log on details in the handbook. Christine and I live in Baslow just 4 miles from Bakewell and so are able to be on hand to look after our cottages and our guests if there are any problems. We have a local business which provides services all over the Peak District and so we love the area and know it well and are always pleased to give local information to help you make the most of your stay. Christine and I moved to the area 19 years ago and set up a business providing services to local residents and businesses which has enabled us to become part of the community and also to come to know the area very well. We love the beauty of the countryside but also the diversity in the villages, the local customs and festivals and of course the people who live here. Bakewell is in the centre of the Peak District and is a real tourist attraction in its own right, but it also makes the surrounding area very accessible whether by car, on foot or by public transport. Whilst on a hill the cottage is truly within easy walking distance of the town centre and other attractions. It is near the church and the Bakewell Museum for example. Parking in Bakewell is always an issue so we ensured each of our properties have designated parking, and at Anne Cottage there are places for two cars. For your convenience free Wi-Fi access is available. Anne Cottage is rated 4 Stars by the Tourist Board and has the modern facilities you would expect but at the same time retaining many 17th century features and the charm of an old quaint cottage. En-suite bathroom to bedroom 1 with bath/shower over, w/c and basin. En-suite shower room to bedroom 2 with w/c and basin. Full central heating with thermostat in the dining area. The dining area with exposed stone wall has a table and chairs to seat 6, welsh dresser and pretty coordinated fabrics. The lounge has two leather sofas, wall mounted flat screen TV, DVD player, radio and CD player. Bakewell has a pool in the centre of town. Notes on accommodation: Dogs are welcome downstairs (Supplement payable) Wi-Fi is available free of charge. Outside: There is a very small enclosed yard to the rear but it is not suitable for dogs. Utility Room: Fridge freezer, microwave, washing machine/tumble drier and sink. Cleaning / Towels / Linen / Maid service: Towels and linen are included and the property is cleaned weekly or between lets. Cottage was lovely and warm when we arrived. Had everything we needed for our stay. Cleanliness was good, lovely clean white sheets and towels. Location was excellent short walk down a hill to Bakewell where we found plenty of dog friendly cafes and pubs. 2 car parking spaces directly outside Anne Cottage was a bonus too!! Cottage was perfect for our 3 night stay, tea, coffee& milk on arrival was a nice welcome. Great location for exploring Bakewell and walks! We are so pleased that Anne Cottage was the perfect location for Jodie. We are carrying out some upgrades shortly and have new leather sofas and a bedroom carpet on order which is just part of our annual program to keep this cottage and Brew House our other property in Bakewell up-to date and our guests happy! We thoroughly enjoyed our stay in Bakewell and Anne Cottage played a big part in that experience. The cottage was clean, warm and had everything we needed to enable us to cater for ourselves or take the short walk to many local eating places. The uphill walk back is a great way to burn off those calories! Only negative is the parking. Roadside and sideways on, close to cottage wall. The road is very quiet at night. We really appreciate the good review from Elaine and even more so that she enjoyed her time at Anne Cottage.Although the parking arrangements were not found to be ideal its worth noting that parking in Bakewell is not at all easy to find, and when its reserved and free and for 2 cars at one property it at a premium. Aside from that, we emphasize that although the road is a main access route to the secondary school about 1 km away and so does have daytime traffic, it is quiet and peaceful at night. We refurbished the kitchen in January which made a huge improvement and that has been reflected in this being the busiest year since 2006 when we bought Anne Cottage as it has proved so popular. We would welcome Elaine and her party again in the future if they wish to return. The cottage was absolutely charming. Two bedrooms with a bathroom each. Well equiped kitchen with space for dining and a lovely little livingroom. Situated well to the center of Bakewell, where shopping was really good. The old stone building was cool inside, which was a relief this very hot summer. No garden (stamp sized backyard), but when you're out all day, who needs it when you are out all day. Nicely situated for lovely walks and excursions in the Peak District. I highly recommend this cottage and thank the owner for having us as guests. We are delighted our guests enjoyed Anne Cottage and appreciated the charm and character of this lovely old cottage. The kitchen was refurbished earlier this year and its good to know that it worked well for these guests and that they made the most of the cottage's location. We would be very pleased to welcome Dennis and his family in the future. Lovely cottage, comfortable with everything we needed. Having the parking spaces were invaluable as Bakewell was very busy over the bank holiday weekend. Would love to visit again! If you are a cyclist we can help you with routes locally. There are numerous flat cycle routes such as the Monsal Trail and the Tissington Trail nearby which are old railway lines and are car free and where cycle hire is available and of course there are many hill tracks and trails where we can help. Fly fishing is available on the Wye. We are about an hour from East Midlands and Manchester Airports. Local bus routes can be used if you want to avoid a car and the nearest train stations are Grindleford or Chesterfield. Booking Notes: We have a Booking Form with our Terms and Conditions which we ask you to complete. Changeover Day: Weekly bookings: Friday to Friday or Monday to Monday Short Breaks: either Friday or Monday Notes on prices: Our changeover days are Friday and Monday Short Breaks are Friday to Monday or Monday to Friday and are normally charged at 75% of the weekly rate but please phone for a quotation as it may be less. We charge a supplement per dog of £5.00 per night Wi-Fi is available free of charge At Christmas and New Year we charge for the holiday period and we allow 7 days per period however if the guest stay is less than 7 days there is no discount.